Sydney and I are Farmer’s Market addicts. Between the warm Colorado early summer air and the aromatic smells of the produce, the Farmer’s Market becomes almost as captivating as Fifth Avenue (almost!). The strawberries were intoxicating this past weekend; I was elated, and bought more than we needed. 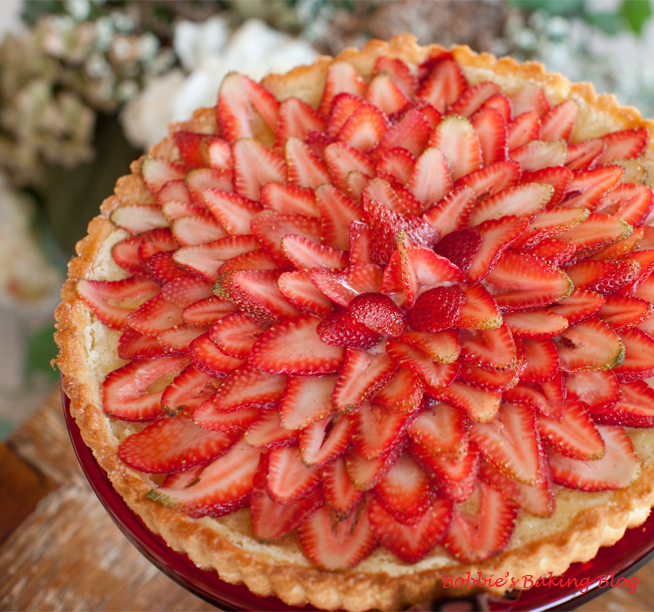 Since strawberries are Sydney’s favorite summertime fruit we decide to create a Crème Friache Frangipane Strawberry Tart. Generally we add rhubarb to our tarts, but there didn’t seem to be any rhubarb, and the ginger root looked plump and smelled fragrant. 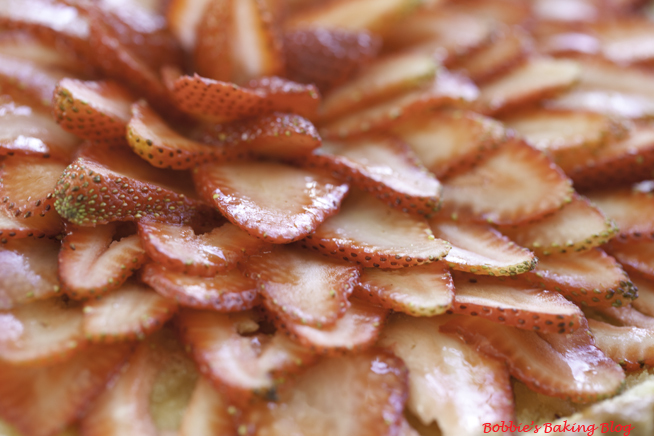 As odd as this may sound strawberries have a special place in our lives. When Sydney was young I planted a Small strawberry patch. Anyone who has ever planted strawberries, will appreciate small and strawberries as an oxymoron.Needless to say my entire garden, that year became a gargantuan sea of red juicy strawberries. I think I developed over twenty recipes using strawberries, strawberry soup, smoothies, tarts, candies, strawberry glazed Cornish Game Hens.. nothing was off-limits. While Sydney and I were in France last year the strawberries season had begun and we found the most alluring angelic strawberries. The red color was deep, the aroma leap from the stand, and they were the size of small peaches. I had never seen strawberries of this magnitude, I bought the biggest crate there. We had so many strawberries in our hotel room, I found myself giving some away to the room service gentleman each night he brought up our late night snack! After throughly exhausting the Farmer’s Market we headed home to create delectable treats with the seasonal produce. We began working with the plethora of strawberries first. Almonds are a wonderful partner for the strawberry, therefore we ground a few up for dough. Almond paste also became apart of the filling along with crème frâiche and Amaretto. All of Sydney’s favorite flavors! Looking at this photograph I wish there was a piece left over! In the blow of a food processor pulse butter, almond flour and sugar, pulse between 10 to 15 times, or until the almonds and sugar is no longer visible. Add flour and salt pulse 15 more times, or until the butter is the size of peas. In a bowl whisk the egg yolk and ½ of the water, add to flour mixture, and pulse about 5 to 8 time till amalgamated. If the dough does not come together add the rest of the water through the feeding tube and pulse about 3 to 4 times. Dump the pâte Sucrée in a large zip lock bag and gently press the dough together. Lightly flour your work surface, remove the dough from the bag, knead it twice, or until the dough comes together. Flatten the dough into a 15 cm/6-inch disk, wrap with plastic film and store in the refrigerator for 30 minutes. Remove the chilled dough, lightly flour your work surface, and place the dough directly in the center. (It can be easier to roll between floured plastic film). Using a rolling-pin roll the dough out to a 3mm/ 1/8 inch thick circle for a large tart or 2mm/ 1/16 inch for a smaller size. Using a pastry brush gently brush the excess flour off the dough, lift the dough gently and fold it in half over the rolling-pin, carefully transfer the dough into the tart pan. Unfold the circle to cover the bottom of the pan and remove the rolling-pin. Slowly, this is not a race; turning the tart pan, gently push the dough into the bottom of the pan, lightly pressing without stretching. 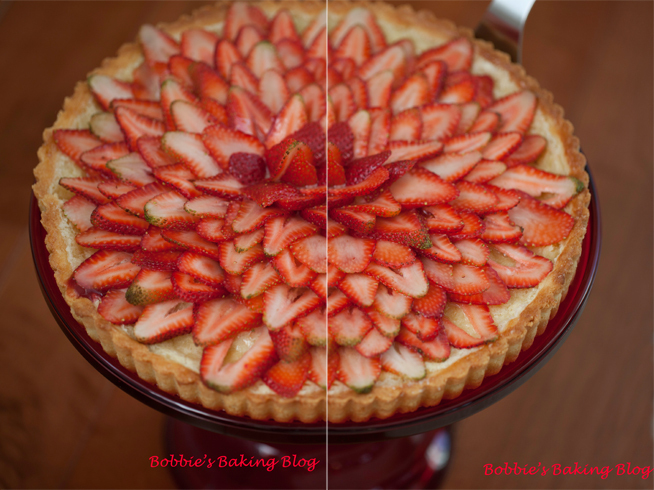 Evaluate the tart for holes and fix them as needed, pinch the excess dough around the edges to makes it look neat. Using a docker or a kitchen fork, dock the bottom of the shell, and rest once again in refrigerator for 30 minutes. Preheat the oven to 220 degrees C/ 425 degrees F.
The Pâte Sucrée needs to be blind baked, line the cold shell with a coffee filter and fill it with raw beans (take care to gently push against the sides). Bake the tartlets for about five minutes, lower the heat to 190 degrees C/ 375 degrees F. continue to bake for 10 minutes, lift beans out of the shell and finish baking between 5 to 10 minutes. The dough should be cooked through and lightly browned. Prepare your mise en place and preheat the oven to 375 F.
In a food processor pulse the almond paste and sugar, until the almond paste is in fine particles. Add crème frâiche, the egg, pulse till incorporated and add almond extract, vanilla, and Amaretto pulse till incorporated to a soft cream. 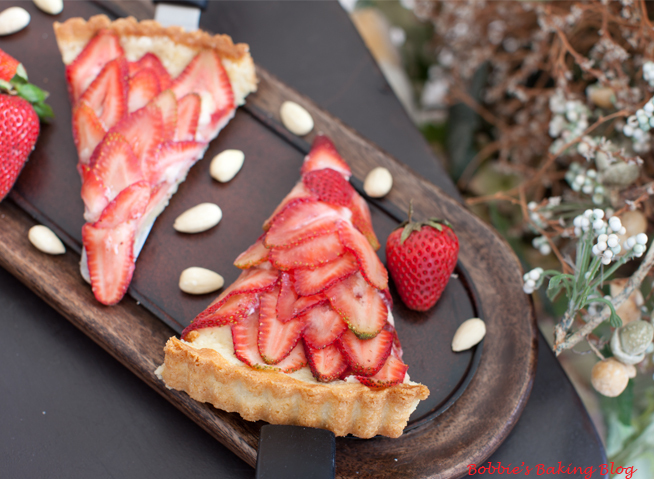 Pour the almond crème into the tart evenly sprinkle with sanding sugar, the custard will absorb so much sanding sugar, so don’t be afraid to add more. Stop when it appears it will not allow any more sugar. Using a pastry brush, brush the tart edges with the egg wash.
Bake the tart till the crust is golden brown and the custard has set, but still has a jiggle. Hull and cut the strawberries, add the ginger, sugar, and macerate for 30 minutes. 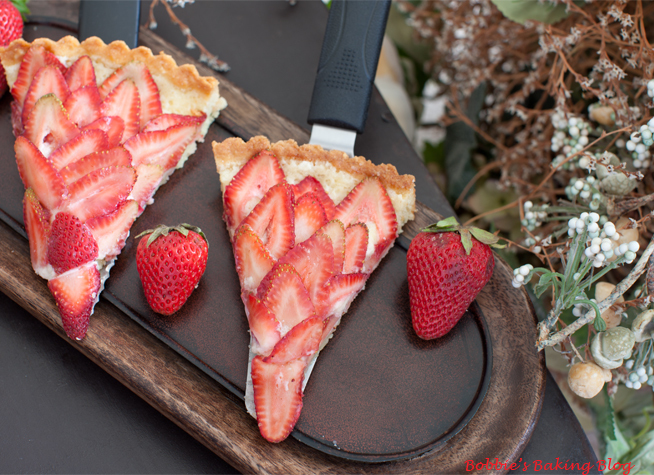 Decorate the top of the tartlets with strawberries. Add the macerated strawberry juice to the raspberry sauce and brush the decorated top with raspberry sauce. 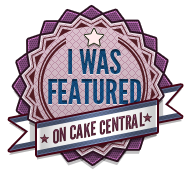 I love recipes that allow me to travel down the nineteen year memory lane! May strawberries remain apart of our lives forever! Gorgeous tart! Those strawberries are so vibrate and red! Your tart rocks! Extremely amazing looking, keep it up!! YUM!! Delicious tart, can’t wait to try this one! WOW, a must have recipe! I love the way strawberries lay, absolutely fantastic! I love this tart! The strawberries look wonderful, and the design is beautiful! 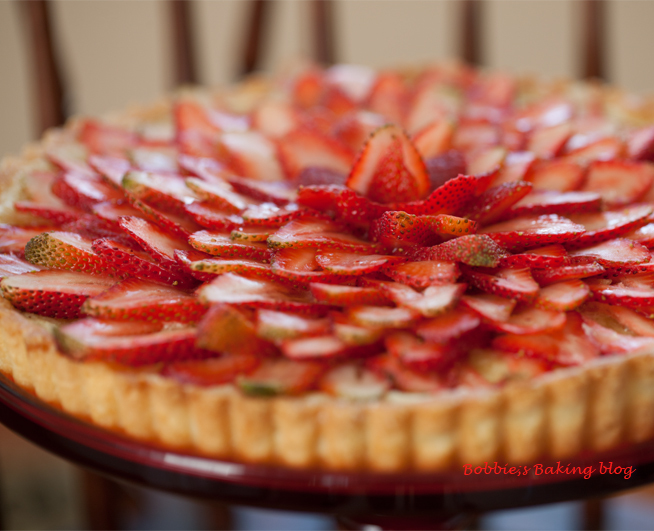 Strawberries and almond paste are two of my favorite things and this tarts is one of my favorite looking tarts you have created! I love it!! The pictures look amazing too! 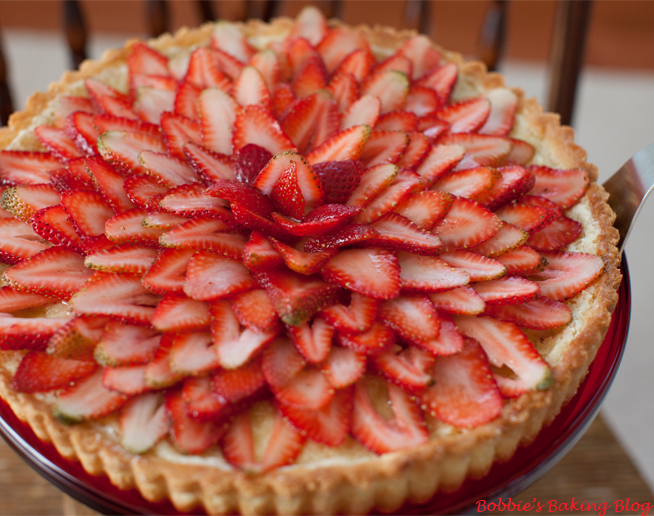 Strawberry tarts are wonderful for any type of occasion. This one looks so elegant and beautiful, you sure do know how to sweep someone off their feet with your food! You have great recipes, the ginger with strawberries is ingenious! Just thought I would stop by and say that this is one beautiful tart! You really have a great talent. Also, you pictures are beautiful, can’t wait to check back on what new and amazing pastry you made!